When we woke up on Friday, the weather wasn’t what any of us had hoped it would be. The skies were grey and cloudy and there was rain beating down. We had a hearty breakfast of porridge and then layered up before heading out. The plan was to cycle to Col d’Aspin via Col de Coupe as part of a 72km ride. Col D’Aspin is a 12km climb to an altitude of 1489m with a minimum 6.5% and maximum 8.5% gradient. We hadn’t got far from the farmhouse when Jose had a mechanical, but we carried on. Then Poppy got a puncture, so she sheltered in the garden of a French family whilst fixing it. We carried on towards the turning for Col de Coupe. The route continued up a small incline that is traversed by an abandoned railway line. Neill was just ahead of me. He hit the wet tracks at an angle and went down. I swerved to avoid him and glanced over, calling out, “Are you OK?” At that moment, disaster struck and I also slipped. It was totally unexpected, so I landed with my full body weight on my elbow. Elena then fell immediately behind us. Everyone stopped and Graeme came over to check that we were all OK. I was quite startled and a little tearful and winded, but I sucked it up so that we could continue. We carried on to Sarrancolin, where we sheltered in the village. 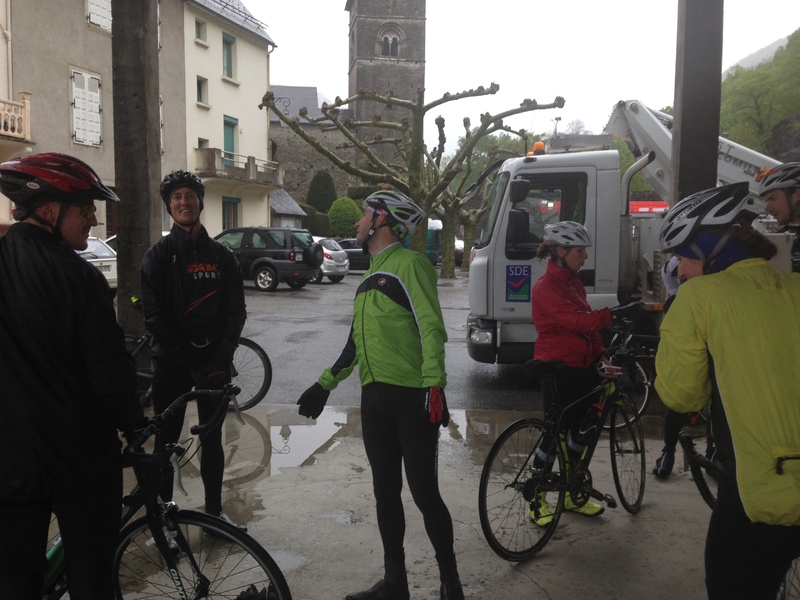 Everyone was soaked and quite a few people didn’t have sufficient wet weather gear, so Graeme made the sensible decision to call off our ascent of Col d’Aspin. When we got in, everyone agreed that it would be best if Kat’s core session were called off. As an alternative, we visited Intermarche and the local sports store. Stu and I bought a bar of pistachio chocolate, but we didn’t need to buy anything in the sports shop as we had packed for all eventualities! By this time my right elbow was really painful and had swollen quite badly. I was unable to put my hand to my head, which meant that I couldn’t brush my hair or take out my contact lenses. I was also unable to dress myself. Fortunately, Louise took pity on me and used her skills as a physio to assess the situation and massage my arm. She quickly surmised that nothing was broken. I decided to take some ibuprofen and wanted to go to sleep, but it was difficult to sleep as I was so uncomfortable. To exacerbate my problems, I was also struggling to breathe and needed to use my inhaler several times in the night. I was so disappointed that the day had ended that way but went to bed hopeful that I’d be feeling better in the morning.